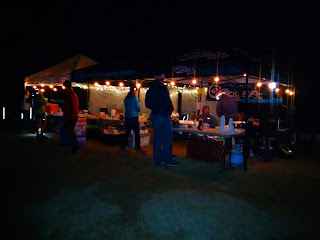 I was recently volunteering at The Rio Del Lago 100 Miler and everything was business. A wave of runners had come through our aid station and every volunteer was on point filling bottles, ladling soup, restocking the table or rummaging through bins for band-aids or other random items. Every runner was diligently being taken care of. After sending a runner off with a breakfast burrito and a full pack, I turned to walk back to the warmest part of the tent. My toes were numb and frozen. I glanced off to the side of the cooking area where a lone runner sat, eyes fixated blankly out into the darkness beyond the tent. Something in me connected with him. It's been over a month since I finished that 50 miler and it still feels like there's a piece of gravel embedded deep in my forefoot.I've decided I would embrace a prosthetic right now. Please, I'll buck up and do the gory hacking of my foot off if someone would gladly donate a bionic foot for me. Really. I've had it. So, obviously, I haven't been running lately. What's new, right? Instead, I've been vending at local races, working full time, hanging out with my boyfriend Megaphone, taking care of family stuff, and trying to be as consistent as possible with the gym. I miss having goals though, but until my foot is back to normal I don't feel comfortable putting anything out there I can't do right now. This neuroma is unpredictable and I can't say when, if ever, it will be back to it's normal, dormant self. But oh well. At least I have the gym and its not like I ran much before anyway.